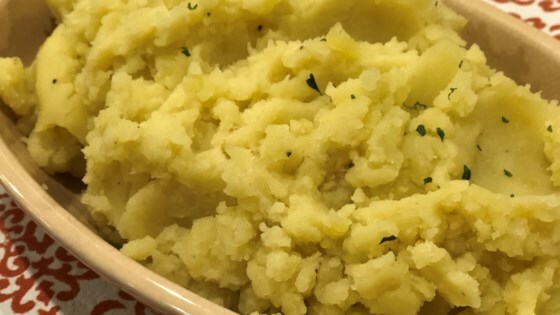 "Try these creamy, buttery, and totally irresistible garlic mashed potatoes made in just minutes in your Instant Pot® for a completely mess-free easy dinner." Combine vegetable broth, potatoes, garlic, and 2 teaspoons salt in a multi-functional pressure cooker (such as Instant Pot(R)). Close and lock the lid. Select Steam function according to manufacturer's instructions; set timer for 15 minutes. Allow 10 to 15 minutes for pressure to build. Strain potatoes and place back in the pot; mash until creamy. Mix in butter, milk, and Parmesan cheese. Season with remaining salt and nutmeg.